BinMaster Rotary indicator lets you know when the bin is nearly full, saving lots of scoop time. In the heat of harvest or transferring grain, the last thing you need is a bin that upchucks on the ground or plugs the leg. BinMaster's Rotary Level Indicator can prevent that frustration and works without requiring trips up a ladder to check on the grain load. The device is commonly mounted through the bin wall near the top of the bin, with the motor enclosure outside the bin and its stainless steel paddle inside. The rotary paddle turns until grain filling the bin stops the paddle, triggering an alert to a light or alarm system. Up to 24 rotary devices can be wired to a single control panel to monitor the levels of multiple bins. 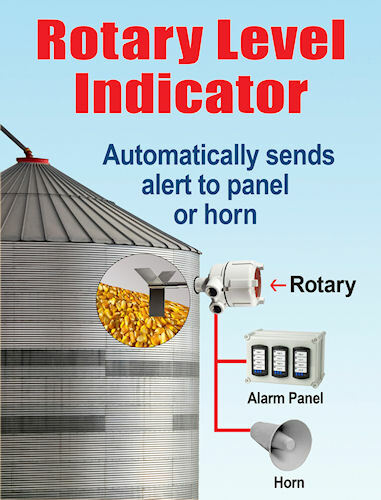 If you've ever been in a grain storage when a bin overflowed, you know a device like the BinMaster Rotary Level Indicator can save a lot of grief and extra work. All BinMaster Rotary devices are approved for high dust levels. For more information on the level indicators, visit www.info@binmaster.com to see what model is right for your application.